Back at the start of 2007, I ran as a candidate for JETS, the one-off fanfund to send a European fan to “Nippon 2007”, the Worldcon in Yokohama. I knew that I’d be running against a couple of friends of mine: “Reverend” Jim de Liscard, an old mate, and Abi Brown, not only a friend in her own right but also the daughter of an old mate. What I didn’t know is that I’d be running against Chris O’Shea, who not only is also an old pal but is also a very big-name fan and organizer of the ’07 UK national con, putting it together at the last minute when the previously-planned event fell through. Chris is a well-known, much loved and very highly-regarded guy and as soon as I learned he was running, I knew he’d win. And indeed he did, and deservedly so. However, one has to make the effort, so I put together a ’zine, distributed it at the London meet and at the Eastercon and got a few votes. Apart from mere self-promotion, my purpose was to show that I can actually write - and indeed take passable photographs, too. 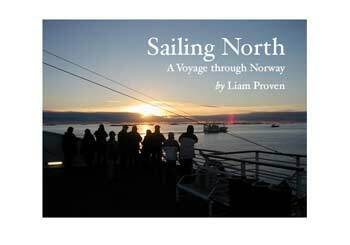 Sailing North was a travelogue about a trip I made to Norway a couple of years ago. It’s not really a fanzine per se, although I hoped that it made for interesting and entertaining reading. It was a sort of perzine inasmuch as I wrote it all myself, but it was purely a piece of travel writing. Be warned, there’s nothing about SF or anything remotely fannish in it. Until, to my amazement, I discovered that I was listed as being eligible for a Nova award - a fan-writing prize given at Novacon, the UK’s second-biggest annual con. I was stunned. Not for an instant did I expect to win anything and I wasn’t disappointed - but I was a little disappointed that many friends said “you published a ’zine?” Clearly my distribution efforts weren’t up to scratch. So, here it is. I hope you enjoy it. Comments and criticism are very welcome. Thanks for reading. 53 Veals Mead, Mitcham, Surrey, CR4 3SB, UK.